The Waldorf-Astoria’s Yves Saint Laurent store was evacuated Sunday afternoon following a robbery in which shoplifters pepper-sprayed a security guard, police said. Source: City of Chicago Data Portal, "Crimes 2001 to present"
Two teenage girls entered the store around 3:30 p.m. and soon headed for the door with high-end merchandise that they didn’t pay for. When the security guard tried to stop them, one of the girls sprayed him with a chemical agent, according to a police spokesman. The offenders were both described as black females between 16- and 18-years-old who have hair extensions that reach past their mid-backs. They were both wearing white halter tops with exposed midriffs and light blue yoga pants or blue jeans with white gym shoes. The duo was last seen heading northbound on Rush Street from the store’s location at 11 East Walton, police said. 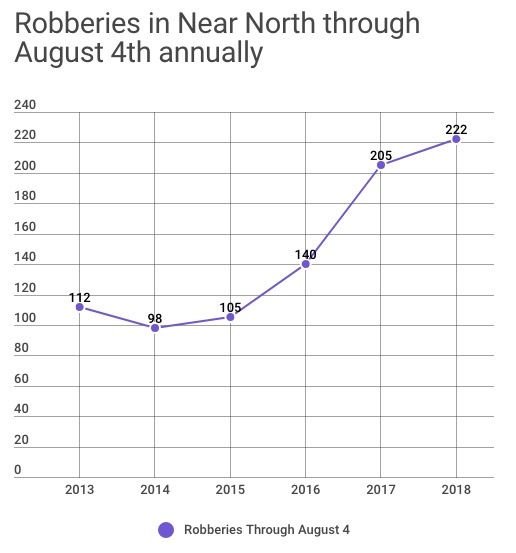 Robberies in the Near North community area, which includes River North, the Magnificent Mile, Streeterville, and the Gold Coast, are up sharply over the past two years. Through August 4th, 222 robberies had been reported in the neighborhood this year, according to the city of Chicago's data portal. That’s nearly a 100% increase compared to 2013.